Nina has always known who she's supposed to be. But is that who she truly is? Nina Gregory has always been a good daughter. Raised by her father, owner of New York City's glamorous Gregory Hotels, Nina was taught that family, reputation, and legacy are what matter most. And Tim--her devoted boyfriend and best friend since childhood--feels the same. But when Nina's father dies, he leaves behind a secret that shocks Nina to her core. As her world falls apart, Nina begins to see the men in her life--her father, her boyfriend, and unexpectedly, her boss, Rafael--in a new light. Soon Nina finds herself caught between the world she loves, and a passion that could upend everything. Last year, The Light We Lost grabbed me and didn't let go. 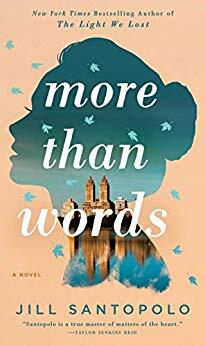 So when I heard that More Than Words was being published, I was eager to read it as soon as possible. Jill Santopolo did not disappoint and I liked this novel even more than her debut! At first I wasn't sure that I'd be able to relate to Nina, as our lives are so different. We're also ten years apart in age. However, Nina was extremely relatable and I could even understand and sympathize with what she was experiencing. Her voice kept me going throughout the story, and I did not want to put it down even when I had to get back to real life. I loved the picture Jill painted of New York City in this novel and could easily visualize all the places that were mentioned, even if I had never personally seen them. The descriptions of people also made them come to life in front of me. The conversations were genuine throughout and I could practically hear the characters talking as if I were listening to an audio book instead of reading it on my Kindle. Nina is put into some interesting predicaments and I liked seeing how she tried to handle each one. The sexual tension between Nina and Rafael is so hot that it was hard for me not to ship them. Based on both her debut and current novel, Jill has been writing on some topics that are clichés in women's fiction. However, she writes beautifully and puts a new spin on them. I would love to see her find something new and original to write about for her third novel (because I don't want her to stop writing, ever). I also would have preferred Nina to not be so wealthy because it made her struggles seem more like first world problems. It would have been nice if there were some closure between Nina and one of the other characters, but maybe we can revisit that in a sequel down the road? Overall, I really enjoyed More Than Words and I hope readers will check out this gem of a novel. Thanks to Putnam for the book in exchange for an honest review. They have one copy to give away! Giveaway ends February 11th at midnight EST. The only of my parents that is still alive is my mother. So, she is the one I am closest to. Both of my parents have passed, but when they were alive, I was definitely closer to my Mom. I would say both. I am fortunate to still have my mother with us. My father passed a bit over a year ago and miss him terribly. My mother but she is no longer with us. My parents have both passed away, I was close to both of them and miss them every day. I'm close to both of my parents. My mom but she is no longer with me. Thanks for the chance! My mother, but I do miss my father. I was close to both my parents. I was closest with my Dad. I was close to both my Mom & Dad, but sadly there both passed away a number of years ago. Thanks for your generosity. Both of my parents have died in the last several years but I was always closer to my Mom. My mother but she has passed! I am closest to my mother.